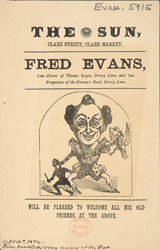 This leaflet advertises a performance at the Sun Music Hallby Fred Evans, a well known clown and pantomime Harlequin. Indeed, pantomimes were first known in Britain as Harlequinades, taking their name from this staple character: an almost supernatural being dressed in spangled costume, who acted as the moral or satiric centre of the play. Harlequinades were dominated by mime, with the Harlequin narrating the action and commentating on the foibles and follies of the other characters. By the mid-1800s pantomimes were no longer mimed and fairytale-derived stories such as Mother Goose began being performed across the country. Evanion has written on the leaflet, "These hand bills given away at the Best".